Q1. How much will the bridge cost? A: The project is anticipated to be about $4 Million with the current design and the features to create the Bicentennial experience along the journey to the Island. The final cost of the project will be based on the total of donations and features that are sponsored. Q2. How much money has been raised and what are the sources? A: The pledges from private donors and some local city sales tax dollars total over $2.3Million at this time, the majority of which are private donor pledges. Q3. When will the project be completed? A: The project will take about a year to construct. Land conveyances have occurred and preliminary permits have been secured. The timeline for completing the project depends on fundraising the remainder of the project funds. It is anticipated that the bridge will be open for the Bicentennial (2021). Q4. Why the name Bicentennial Bridge? A: The project is substantially connected to the Missouri State Capitol Grounds, and the connection to our upcoming State Bicentennial creates an opportunity to commemorate our State’s beginnings and celebrate our rich history. Q5. How long is the bridge? A: The bridge itself is about 830 ft. long. The trail from the Veterans Memorial to the Island is about 1,000 ft. The bridge will be accessible by those with disabilities and the experiences along the bridge will allow for visitors to go for strolls as long or short as they desire to take in the views and interpretive stops or galleries along the way. Q6. How big is the Island and what will you do there? A: The Island is about 30 acres of mostly forested land today. It is approximately a mile in length as well and extends from the Capitol Complex area all the way south and east to the Missouri State Penitentiary (MSP) site. The activities planned on the park land are passive in nature (trails, overlooks, fishing, viewing gardens, river board walks, wetland viewing areas, and possibly outdoor gathering spaces or amphitheater). A: Like most state or local parks, the Island is along a natural waterway. While the Island will be subject to some flooding, the bridge is designed to land on the highest portion of the Island. While many may believe the Island floods during heavy rainfalls locally, it takes a major regional or national rainfall event to impact the Missouri River stage. The Island was only under water 5 times since 2000 and for a total of 22 days (that’s 0.34% of the time). Q8. What will the rail cars on the bridge do? A: The railcars on the bridge will be galleries to walk through, providing interpretive experiences for visitors. The railcars will provide shade from the sun and some benches for resting or taking in the exhibits. 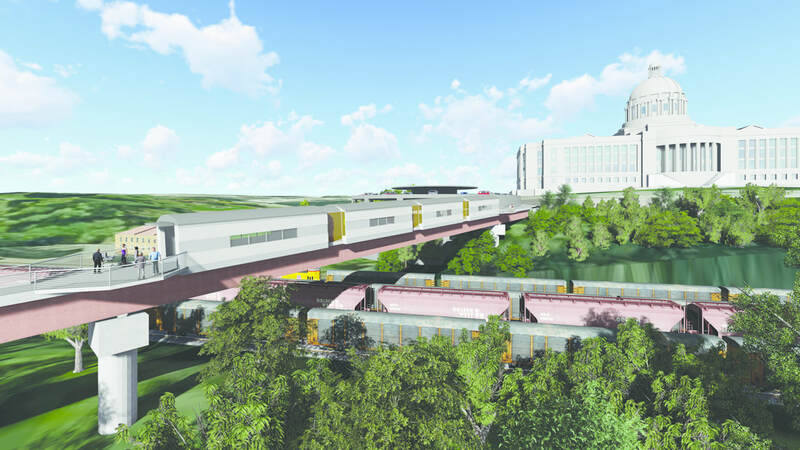 The railcars will also provide a unique experience for those viewing the bridge from the exterior, and connecting visitors to the importance of rail and freight on the economy and the state’s history.